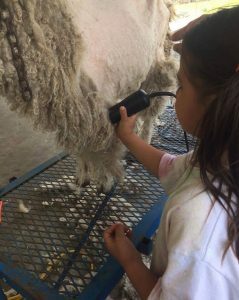 An action packed, hands-on learning experience for kids of all ages, learning how the fleeces on your favorite farm animals become the fibers that make your clothes. Take home a small skein of yarn to hang in your classroom as a momento of your day! 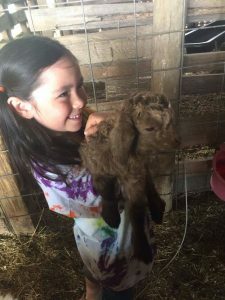 Introduction to fiber animals: alpaca, sheep, and mohair / pygora. Hands on the animals, touching and petting. Explanation of how I shear. 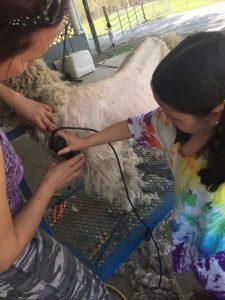 Introduction to fleeces: wool fleeces, double coated fleeces, mohair locks, alpaca fiber, llama, possibly angora rabbit fiber. Hands on experience, plus explanation of why certain wools are suited to certain purposes, ie. Carpet wools vs sweater wools. 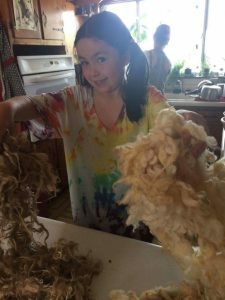 How I prepare wool for spinning – tumbling, washing, carding, blending. 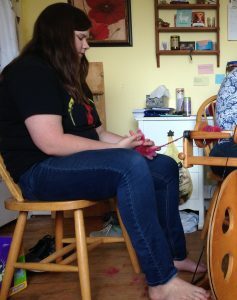 Hands on with the drum carder and hand carders to make some batts from different wools and fibers. 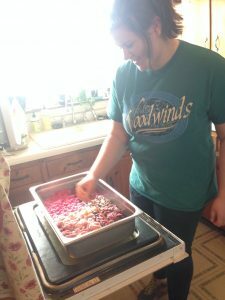 Dyeing fibers, different types of fibers dyed. 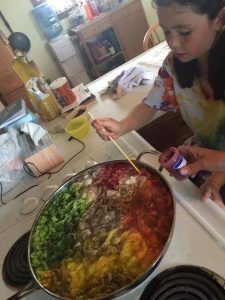 It may be possible to hold a dyeing class for older children (say 7+) for a small additional cost to cover dyes. Younger children may be too risky as there are heat / chemicals involved. 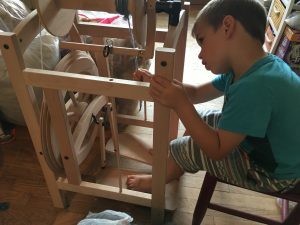 Spinning: hands on with the spinning wheels to make yarn, singles and plyed yarn too. A small deposit paid in advance will be required to hold your spot. Cost varies from $13-25 per child depending on the planned activities. If you would like to personalize this experience in any way, please do not hesitate to ask. We can tailor this to your learning needs!